Last Friday, we kicked off our monthly Faculty Gathering series with an inspiring conversation lead by our Canvas Mentor, Alison Perchuk Assistant Professor of Art and Ekin Pehlivan, Assistant Professor of Marketing. Both have been using Canvas since early this year. Dr. Perchuk shared her personal progression from thinking of Canvas as just another type of Blackboard (“I was doing the same”) to start discovering how Canvas was able to enhance and positively impact her teaching and students’ learning. 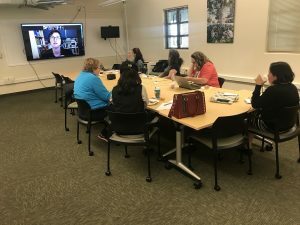 With Dr. Pehlivan’s help, we reviewed some of Canvas’ game-changing features such as Attendance, Collaboration, Calendar (especially the Scheduler) and we closed with a review of the Rubric building tool. Thanks to all attendees and a special welcome to our new faculty members that joined the gathering for the first time. We hope as you continue exploring Canvas for full adoption in Spring 2018, you keep in mind the different training and consultation opportunities available at the FIT Studio. Setting our courses in Canvas is giving us a unique opportunity to look at those courses with new eyes and take some risk in our teaching approaches. Let’s cross that bridge together! Mark your calendars for our next O&B Gathering – November 3rd at 12 pm. We will be discussing gamification (integration of gaming into learning experiences to increase engagement and motivation). Dr. Pehlivan will share her recent experience piloting gamification on her Principles of Marketing class.